Do you ever feel like you’re being whisked away to a far off place when stepping foot into a restaurant? Well, The Dawson does just that for me! Steps from the Grand Blue line in River West, on one of six corners at Grand, Halsted and Milwaukee, this place has loads of character. And a pretty tasty Bloody Mary if I do say so myself! Perhaps it’s the facade of the building that transports me. The design seems to blend right into its industrial surroundings. Or, it might be the two-level silo of floor to ceiling windows that creates the foyer sitting adjacent to the dining room disguised as an old factory. Or maybe it’s the dramatic, entrance created by oversized, wood-panel doors as if you were entering a castle. Inside, the charm continues with a rustic, warehouse vibe of wood plank floors and brick and iron accents. While I’ve dined here before on the patio, today I’m seated at the bar. After placing my order, which consisted of Avocado Toast and the real reason I came, a Bloody Mary (and water and coffee – gotta stay hydrated! ), I watched the bartender go to work crafting my cocktail. First, Reyka Vodka poured into a pint-size glass over ice. Next, the orangey, tomato liquid added, pulled from a large tub in the fridge – definitely a good sign because you know it’s been marinating! On top, a skewer with a block of pepper jack cheese, a green olive and a house pickle. I realized The Dawson’s Bloody Mary was quite unique with an initial zing on my taste buds. Such an unusual flavor that I would describe as tangy and vinegar-forward. The bitter, acidic taste is balanced nicely, though, with a slight sweetness. Initially I found myself taking multiple tiny sips, even swirling it around in my mouth, trying to figure out what was added. I later learned from the bartender that the flavor is derived from two primary ingredients. The first being pickled onion, and the second being a giardinera, both of which are emulsified. For Chicagoans, giardiniera, an Italian relish of pickled vegetables, is a local favorite. People in the city put it on everything from Hot Dogs to Pizza! And The Dawson decided to take this obsession to another level by blending a house-made honey giardiniera right into their mix. Chunks of black peppercorn give it a little spice on the back of the throat. 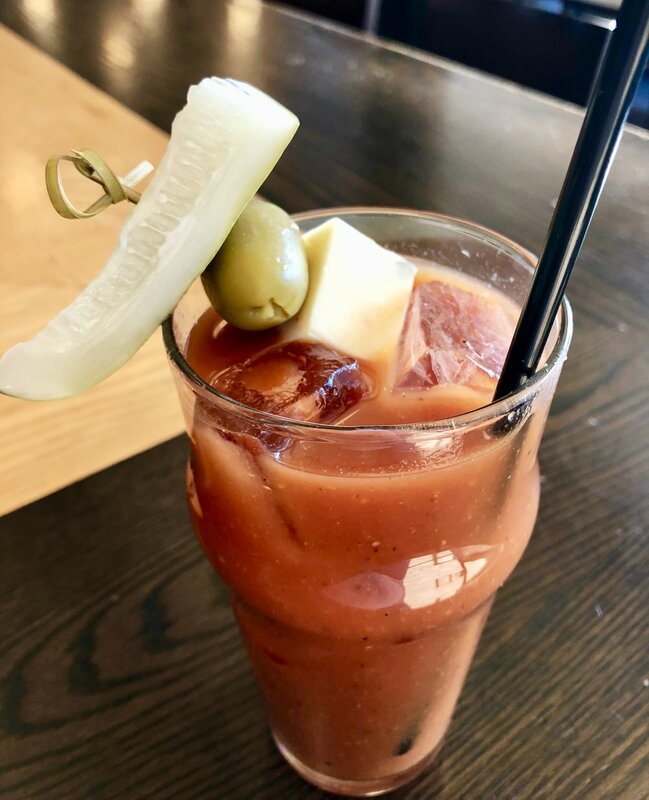 Based in Chicago, Jason is a Bloody Mary enthusiast in search of the best eats, drinks and vodka-soaked tomato concoctions the Windy City and beyond has to offer. Sunday Funday Lover, Curious Foodie and Avid Explorer, there’s never a dull moment in his adventures.